What does "Protestant" mean? What are the differences in worship among Protestants? Who were the Huguenots? What does the Reformation mean for us today? This new book by best-selling author Don McKim answers these questions and many more, providing the essential of the history of the Protestant Reformation. 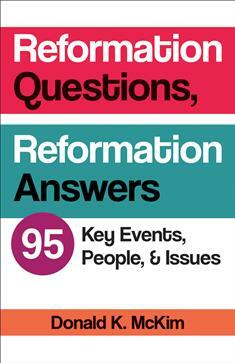 In an easy-to-use question-and-answer style, Reformation Questions, Reformation Answers highlights the key facts, people, and theologies of the Protestant Reformation, as well as major legacies of the historical movement. Published in time for the 500th anniversary of the beginning of the Reformation, this new resource will help readers understand a critical moment in Christian history that still deeply affects who the church is today.